I was looking for a local restaurant (OK, the closest with Indian food) and checked out directions with Google maps. That's the place up in the top left corner (or northwest) with the "A" symbol. Not too hard to get too, though once I got there all the buildings looked the same. 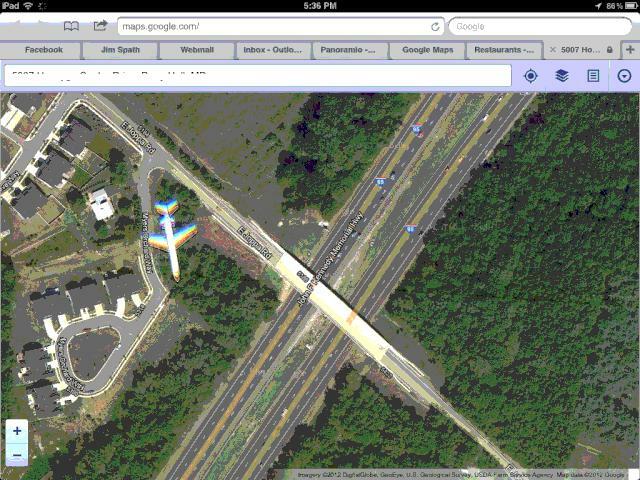 But what caught my eye was a silhouette of an airplane, seemingly parked right next to Interstate 95. I've been on that road (Cowenton Avenue) many times, and if there was an airplane sitting on the someone's driveway I certainly missed it. Perhaps it was because of the winding roads, or maybe it was a recent acquisition of some eccentric neighbor. I don't know, and I needed to find out more. As I zoomed in closer, virtually speaking, I realized this plane was not parked, it was in flight. The ground surface showed trees beneath it, and if a plane had been pushed or dropped there somehow, it probably would have made the local news. 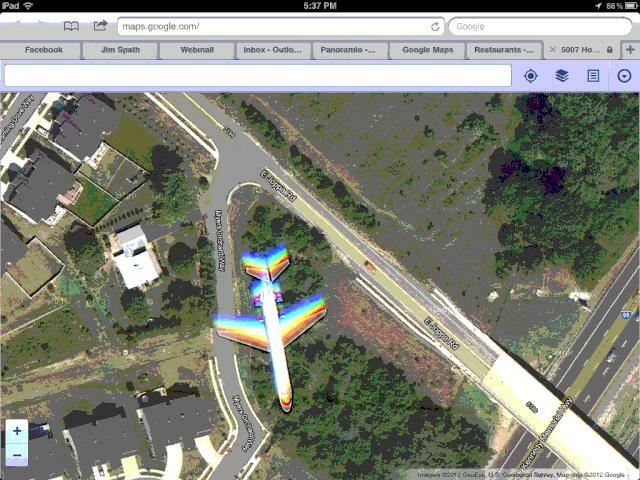 I was curious as to how that happened, with the Google satellite imagery capturing an airplane at some lower altitude. Perhaps someone with better fuselage recognition and good math skills could compute the height of the plane during this photo capture. I'd say it was probably on descent, most likely to BWI, not Martin State Airport. The highest zoom level shows interesting color gradations on the wings and tails. I've somewhat morphed them by shrinking the number of colors to get the image as small as possible for blog viewing under network bandwidth conservation rules. Since Google regularly updates imagery with new versions, I've included a couple links below so you can see if the plane shot is still in the catalog or not. 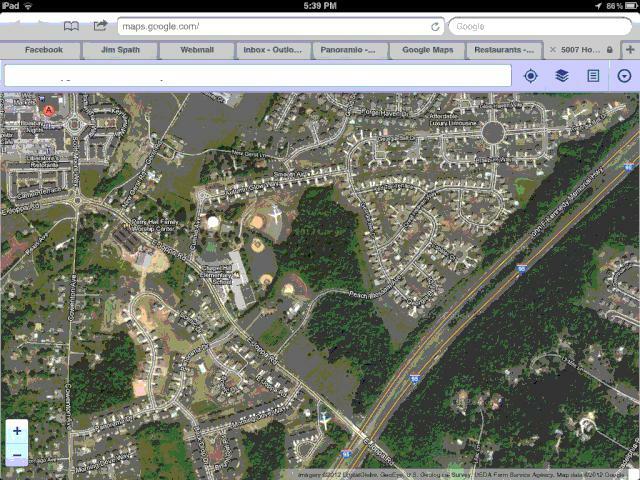 The first is an embedded Panoramio clip, with someone else's shot from I-95 of the nearby Joppa Road overpass in the center. That was a fairly simple way of grabbing the closest coordinates to the image. Finally, if you look at the first shot above, you'll see the same plane is visible twice. At least, I hope it's the same plane, and not some kind of airplane game of tag. It's in the ballfield near "Autumn Glow Way." No, not that kind of glow.